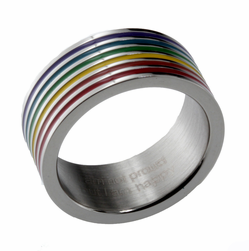 Stainless Steel, "I Am Not Proud, but I Am Happy"
* This is a 10mm wide band ring, size 8 & 9 available. The rainbow color are baked in the Ring channel groves. inside ring engraved: "I am not proud, but I am happy". 10mm wide band ring, use as a ring or pendant. Our brushed satin and polished stainless steel jewelry features unique brilliant looking designs made with super durable 316L grade stainless steel. Polished to a brilliant shine, all these jewelry pieces are strong, durable, long lasting, comfortable and very easy to care for. Do not need to worry the ring is too small or too big to fits, use it as a pendant. A 18" quality 316L grade Stainless steel chain included. This Free complimentary ball chain can be cut to size for your convenience. Or you can use your own special chain to match your preference.